When it comes to coffee roasters in America’s Midwest, outside of Chicago’s Intelligentsia, the one name I consistently hear (and whose coffee I consistently see) more than any other is Madcap, from Grand Rapids, Michigan. I first came across Madcap in 2014 at Box Kite in New York, and most recently at Miami’s Vice City Bean. Along the way, Madcap’s coffee’s been good enough to get on the shortlists for the Coffee Spot’s Best Filter Award in 2015 and for the 2014 Best Espresso Award. Naturally, when planning my recent Midwest road trip, Grand Rapids was the first place I pencilled in (although it was my last stop of the trip). Three are three Madcaps in Grand Rapids. This one, on Monroe Center Street, right in the heart of downtown Grand Rapids, is where it all began, opening as a coffee shop, with the roastery in the basement, in 2008. Although the roastery left in 2015, moving to a dedicated facility on Fulton Street, the coffee shop remains. A large, open, bright space, there are two espresso options, three on pour-over. Naturally, the entire roastery output is available as retail bags. There’s also a small sweet and savoury food selection. Madcap is in the heart of downtown Grand Rapids, a couple of blocks from the river (from which rapids, grand or otherwise, are disappointingly absent). I’d assumed it was in a building (the “Monroe Center”), but turns out that Monroe Center is the street Madcap is on, sitting pretty on the corner of Ottawa Avenue, which Monroe Center intersects at about 135⁰. The main entrance, a broad, tall affair, inset and surmounted by a glass arch, is right on the corner, while there’s another door to the left on Ottawa Avenue. The walls on both sides are effectively floor-to-ceiling windows, which means that the interior’s flooded with light, particularly in the afternoon, resulting in a sense of space, enhanced by the amazingly high ceilings. If you really want to catch the sun, you can sit outside on the broad pavement where there are several two-person tables on both streets. The counter, a massive, dark wooden affair, with a light wooden top (which matches the furniture), is at the back. Like Madcap itself, it’s a strange shape, best described it as rectangular with the right-hand front corner cut off at 45⁰, although this cut-off section, which faces the main entrance, is the longest part of the counter. The till is to the right, at the back, where you’ll find the cakes and savouries, while the cut-off section is the preserve of pour-over, with its EK-43, pair of Seraphim Brewers, and manual pour-over bar (four Kalita Wave filters), all in black to match the other coffee kit. In front of these, an extended shelf holds a long row of retail bags. To the left, the small front section, facing Ottawa Avenue, has just enough room for the La Marzocco Strada and its two grinders, a Mahlkönig Peak and Mythos 1. Meanwhile, the left-hand side has six round stools along the counter’s edge, providing the perfect vantage point for watching the coffee being made. The bulk of the seating is around the edges. Along Monroe Center, a six-person window-bar extends across two windows, while along Ottawa Avenue, between the two doors, are four black armchairs, two backs to the windows, one either side, backs to the respective doors. A pair of four-person tables line the left-hand wall, followed by a two-seat sofa in an alcove, then a pair of standing bars/tables. Finally, a long, thin 12-person communal table occupies the centre, running left-to-right between two thin, iron pillars. There are two options on espresso, the Third Coast blend being joined by an Ethiopian single-origin during my visit, although you have to know to ask for this. There are three options on pour-over (two single-origins and a blend while I was there), plus a flight of three 6oz cups, one of each, which was very tempting. Finally, there’s another single-origin through the Chemex if you want to share. Madcap offers the usual espresso-based drinks, including a cortado (although no flat white). Interestingly, and something I saw in a few places on my trip, you can only order espresso, macchiato and cortado to drink-in. Quite right too! I ordered a cortado, the coffee coming strongly through the milk, but without dominating. Although the coffee is darker than I’m used to, it was lovely, a nice contrast to the sweeter coffees I’m used in the UK. 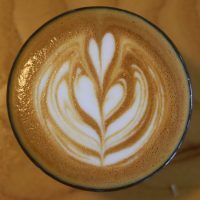 You can see what I made of Madcap’s Fulton Street branch, while for more on the Grand Rapids coffee scene, check out Sprudge’s Coffee Drinker’s Guide. This entry was posted in Cafe/Roaster, Cake, Coffee Shops, Coffee Terraces, Evening Opening, Grand Rapids, Laptop Friendly, Retailers and tagged include, Madcap, Midwest2018 by Brian Williams. Bookmark the permalink.